It's starting to look like Valentine's Day around the house! Kaitlyn and I had a lot of fun decorating for Valentine's Day. We came up with some pretty crafty ways to use things we already had on our craft shelf....in fact I put the entire mantle together without making any trips to my local Hobby Lobby! Which my husband definitely appreciates! Here's how you can get this look using things you might already have around the house. To make the hearts banner I used heart ornaments I bought from Target after Christmas for 90% off....I bought 4 packs for $1, I went to my fabric bin and found all the scraps I had in reds and pinks, I cut them into 3 inch long strips and layered them to tie the hearts together. Each season or holiday I try to utilize my glass jars on my fireplace mantle to reflect the season, but I ran out of ideas and money for February....so I simply used what I had. Kaitlyn used her cutting skills to help me cut small squares of fabric, they weren't perfect and it made quite a mess but that was half the fun. I filled the jars halfway with my fabric pieces and then added some left over glitter candles from Christmas....and Viola! 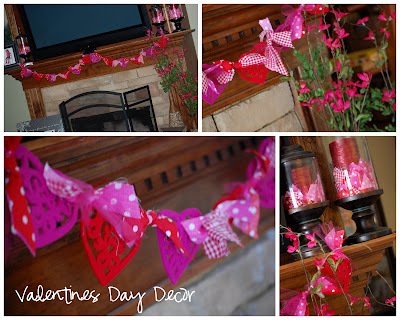 A great look that didn't cost a whole lot of money!.........How do you decorate for valentine's day at your house?